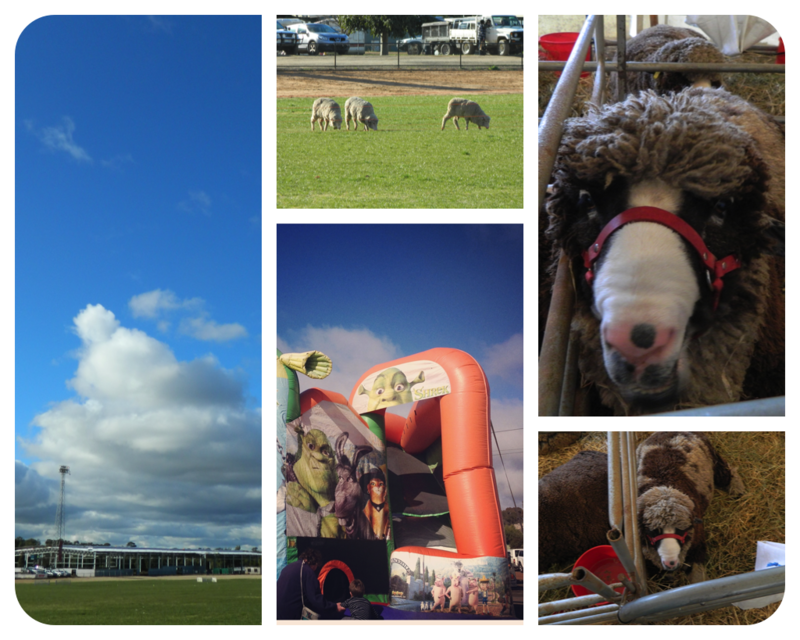 It’s finally time to tell you all about my day at the Bendigo Sheep & Wool Show. I had a super great time, as if you couldn’t guess! And I went with super great peeps! I could write all day about it, but instead I’ll just show you pictures and tell you some of my fave things. I’m not going to talk too much about what I bought, because I’ll do a separate “Bendigo Haul” post. I was totes excited about going this year, partly because I knew what to expect and partly because I actually had a budget this time. So, that always helps, right? First, my lovely friends Kate (who’s blog is here) and Hal met at Flinders Street Station. That’s them in the lower left (Kate) and right (Hal) knitting on the train. 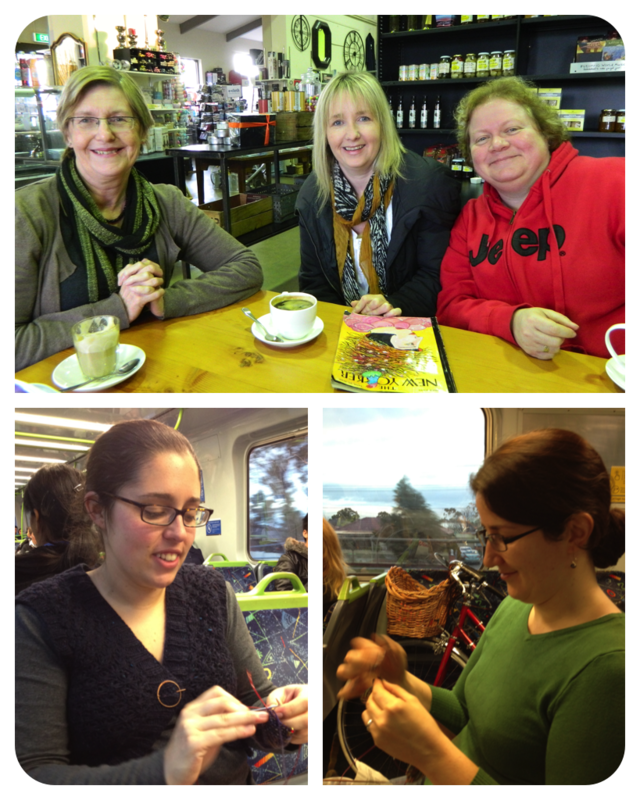 In fact, we were so busy knitting that we missed our station to meet up with the also lovely Jane (top pic, right) and Jeanette (top pic, left). Now, I wash my hands of responsibility for any part in this mishap. “I was following Kate,” I said. “Because you’re a lawyer,” I said. It made sense in my head, cuz, y’know. Lawyers know stuff. To be fair though, we all averred that we didn’t hear the announcement, and were all unfamiliar with that train line. No harm done though, because Jane was a saint and picked us up at the next station and we all went to meet up with Karen (top pic, center) who is Irish and fantastic and we were on our way! We stopped at a lovely cafe in Kyneton for coffee and eggs, though I neglected to get its name. Kyneton was quite delightful and pretty and I’d like to do a day trip there some time. 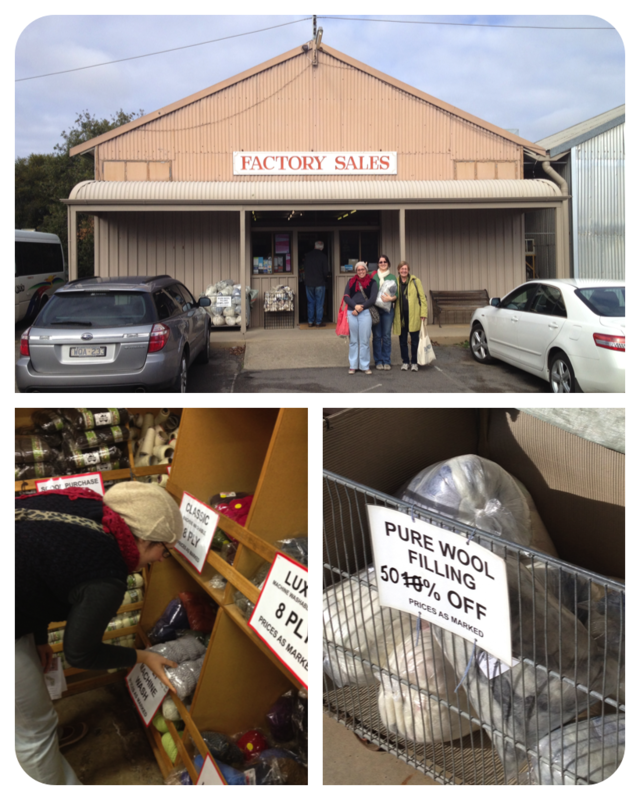 Once we got to Bendigo, we stopped at the Bendigo Woollen Mills first, natch, because their discount back room is a must. I bought a few small balls with lovely twisted colors, and a bag of pure wool filling, because they were practically giving it away. While Kate, Hal, Jeanette and I waited out the front for Jane and Karen to finish their purchasing, we ran into the gorgeous Jules of Woollenflower briefly, just long enough to say hello and exchange big happy hugs. It was a lovely day. Sure, I usually love wet, miserable, gloomy days being a sun-allergic ginger and all, but it was the perfect compromise. It was sunny enough that it was lovely to be out and about, but cloudy enough that I didn’t feel like I was getting skin cancer at every turn. Because we went on the Friday, it didn’t seem that the aminals (deliberate spelling, don’t judge me, I just like saying ‘aminals’) were really on display as much as they were on the Saturday we went last year. Some sheepdogs were practicing, and there were some colored sheep in a tent. See that little guy on the right? Oy, I fell in love him. His little face was so adorable it would break your heart and stick it back together with cuteness. Not even joking. I couldn’t really get the best picture because of the fence and my camera has personal dramas. Also, I didn’t want to blind the poor schnookums with a flash, so that’s the best I could do. Kylie of Ms.Gusset Yarns and Fibers was there, with crazy amounts of beautiful cormo yarn from the Ton of Wool project you may have seen on Pozible. I didn’t buy any because my budget was already spoken for at this point, but I’ll tell you what, I was super tempted! Kate and Hal bought some and were very happy. 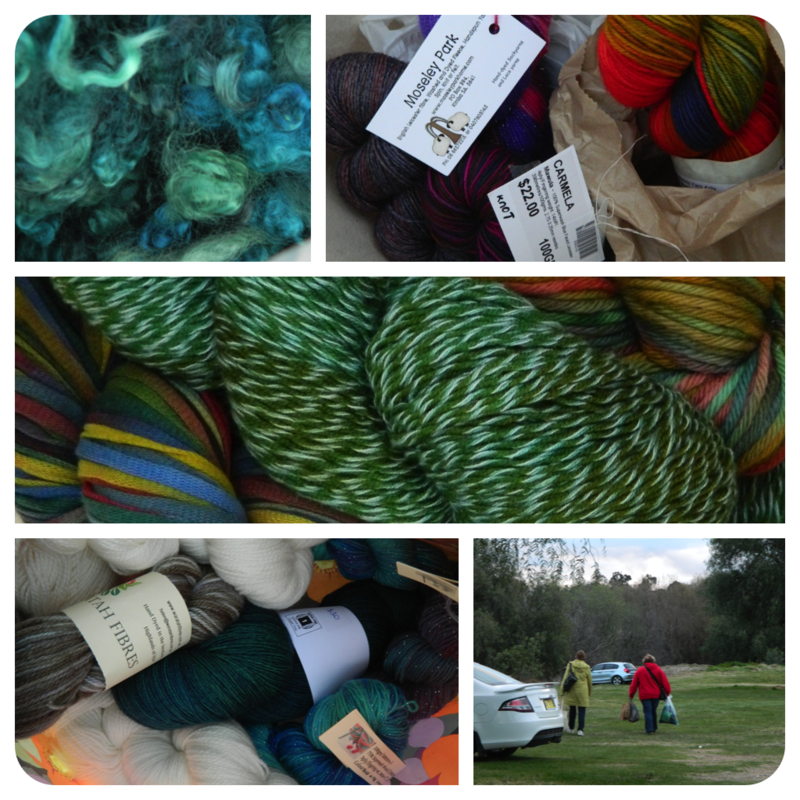 If you go to the ms.gusset Ravelry group, you can find all the relevant linkies and buy some o’ dat yarn! Now, this was my FAVORITE thing EVER at Bendigo. I practically lost my mind at the Stranded In Oz stall. I really can’t even articulate it, it was just overwhelming. Just something about the colors, and the yarns, and the pattern samples just made me all spinny. The Wizard of Oz references also made me heart explode. Kate and Hal bought some of the sparkly yarn in the lower left and I bought some twisted green yarn called “Toe Toe” . Geesh. It’s like it was made for me and waiting for me the whole time. The lady who ran it was an absolute delight also, so you know my inner dialogue was “HERE, TAKE MY ALL OF MONEY!” So, please, please, please do go check out her website here and the Stranded In Oz Ravelry group too. Caps again. Oy. I’m so ashamed of myself. We had a little debrief before we left and I snapped some of our purchases. There’s my Stranded In Oz ‘Toe Toe’ in the middle there. I’m kvelling just looking at it now. I think everyone was super happy with their efforts, though I’m sure we all would have liked bigger budgets. There’s always next year. Jeanette, Hal, Kate and I were all dropped at the station to go our separate way, and unfortunately, we got there with a long wait to go. Never mind! We all started knitting of course! First we decided to add up how many kilometers we’d bought each. I bought 2.25 kilometers of yarn, and I had the least. To avoid the risk of incrimination, I won’t say how much the others bought ^_~ Look how proud and happy Hal looks! N’awww! I heart those peeps. Finally we all got home, and I pretty much crashed as soon as I walked through the door. I was plum tuckered out! But, aren’t those the best days when you have so much fun you’re completely demolished when you get home? I think so! 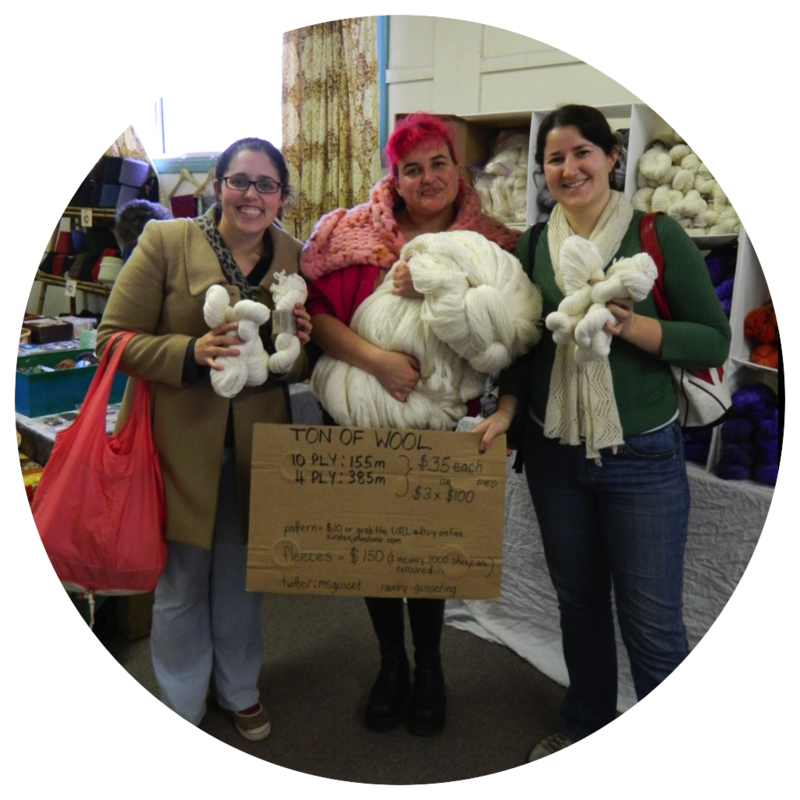 Did you go to the Bendigo Sheep and Wool Show? 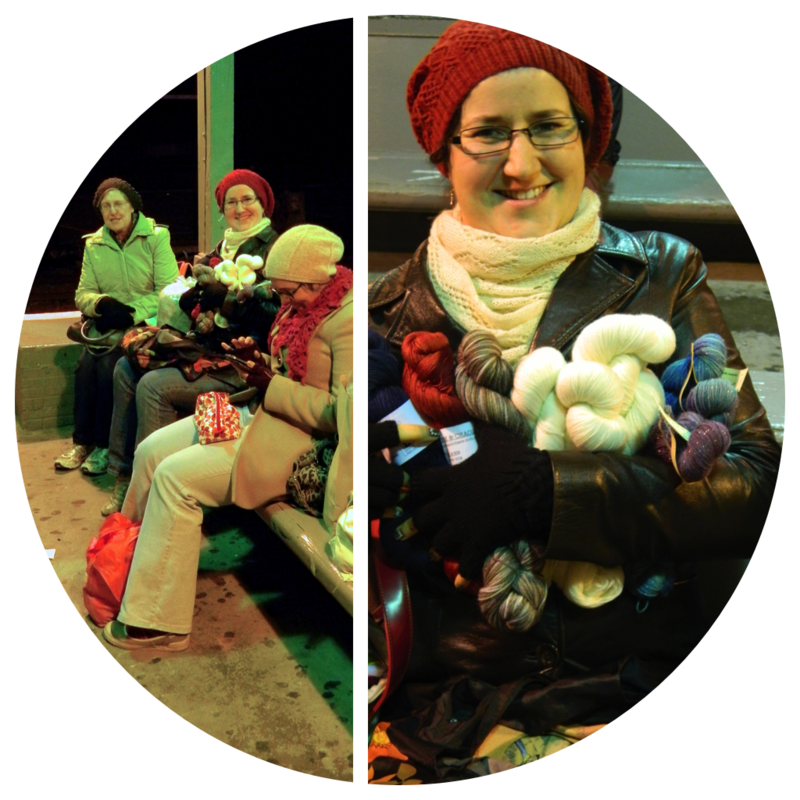 What yarny/crafty festivals do you go to in your area? Sharezies! Spock Hat. Dunzo. Classes. I Haz ‘Em. That looks like the most wonderful day out! We somehow were not in the know and went to Bendigo 2 days before the show started, but I’m already making plans with some work peeps for the Bendigo wool show next year. That green tweedy yarn looks especially lovely. Arg Raynor!!! I have poured over Stranded in Oz’s shop and it’s bookmarked because there’s some lace yarn that I am hoping to squeeze my budget for. 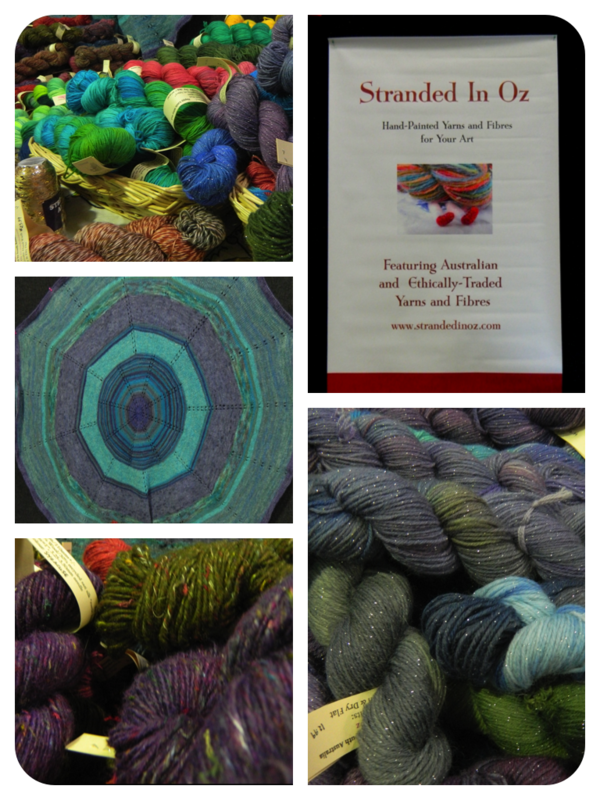 Your photos and descriptions captured your day so well (not jealous though…not jealous…not….well okay at little 🙂 – and so I am also hoping to come to the Wool show next year if I can possibly swing it. In the meantime it will be really nice to live vicariously through you and see your haul from the day. There was simply too much choice, from too many incredibly talented folk, but I’m definitely in for going and seeing them all again next year!!! I love love that green Toe Toe, it’s SOOO you Raynie! Omgee! It should be your background foto! Also NEVER apologize for caps, you use them perfectly, so CAP ON baby! Btw, you were right, the sheepy broke my mexi heart! ❤ aww…. 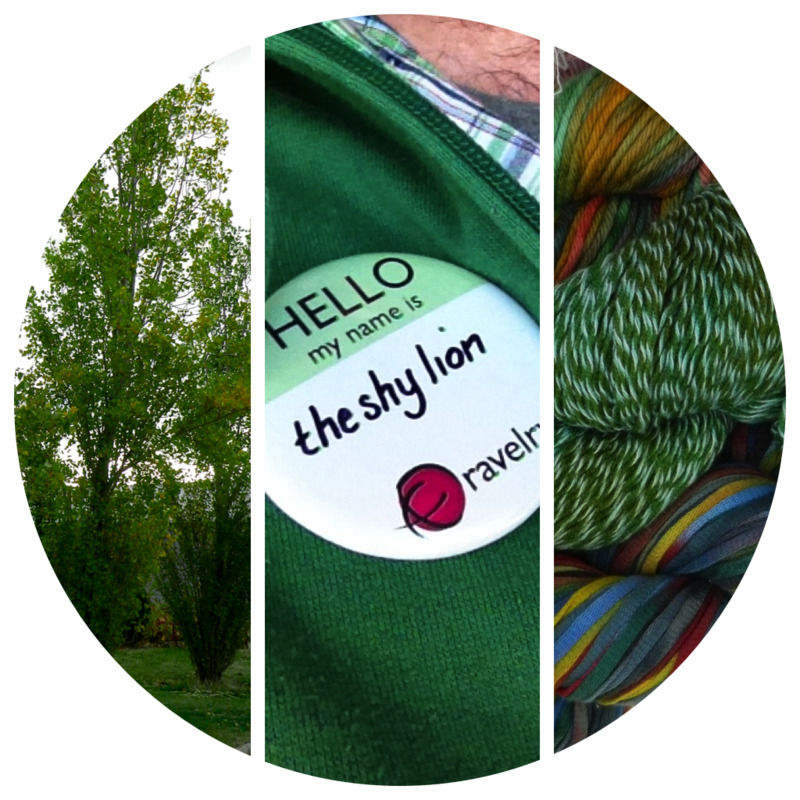 i went to maryland sheep and wool, and rhinebeck is totally soon!!! good times! i really want to inquire about adult bouncy castles now. if you find one, i’m coming to AU. it’s gonna get totes crayyyy. be ready.